This is another light and healthy dish with a tomato base. The recipe uses fresh tomatoes as they give a fresher taste than the canned variety but you could always use a tin of chopped tomatoes if you are in a hurry. Place the potatoes in a pan of boiling water and boil for 5 minutes. When the oil is hot turn the heat down and then add the cumin and mustard seeds. The seeds will start to spit in the pan as you add them. Cook for 1 minute. If they don’t start to spit immediately it means that the oil is not hot enough. This isn’t an issue – just wait until the spitting starts but take care not to burn the seeds by overcooking them. Once the spitting slows, add the chopped onion, crushed garlic and salt and cook until the onion becomes transparent. Then add the ginger and chilli and continue to let the mixture cook on a low heat for a minute or two. Add the turmeric, chilli powder, coriander-cumin powder and garam masala and mix in the pan. 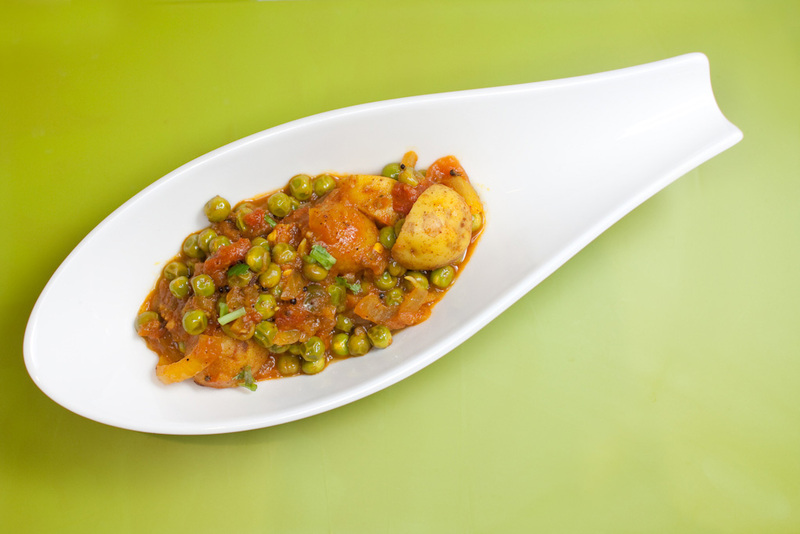 Add the chopped tomatoes, par-boiled potato cubes, peas, black pepper and lemon juice. Stir well. Put the lid on the pan and let it simmer until the peas and potatoes are cooked. This should take no more than 10 – 15 minutes depending on whether you prefer your peas al dente or mushy! Once cooked, garnish with the coriander and serve with a green salad and naan bread or rice.